Visual Studio Code>Other>MrSmileyNew to Visual Studio Code? Get it now. 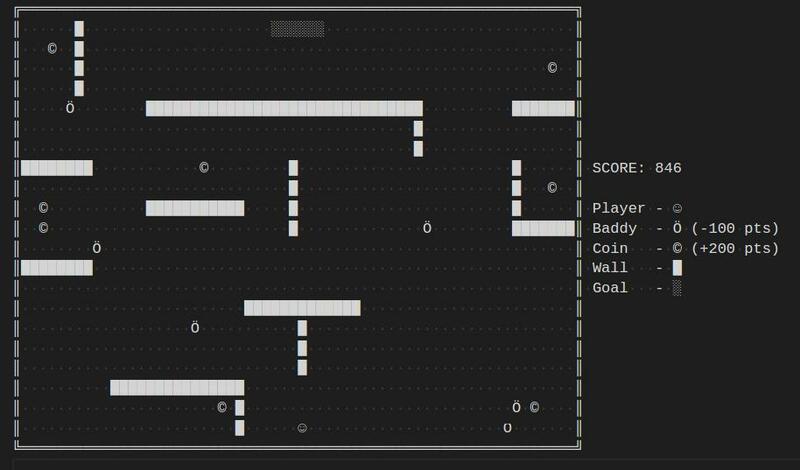 This is a simple and ill-advised game written as a VSCode Extension. Why? Why not? In all seriousness, I made this just to see if it could be done and it exists more as a proof-of-concept than a real, full-featured game. At the very least, it shows an simple way to take input and refresh the screen in the editor. I don't know how useful that is, but it's interesting. Amazing 8-bit ascii action in 2 colors! The point of the game is to collect as many coins as fast as possible and reach the goal while avoiding the enemies. There are no requirements. To run the game, open a new file and execute the "Adeventures of Mr. Smiley" command. If you don't open a new file, it will clear out whatever is open to render the game... which you probably don't want. After you win or get a game over, press space bar to reset the game. There are no settings for this game. However, for optimal gameplay, it might be better to zoom in a little and disable editor.quickSuggestions in user preferences so it won't pop up over and over. Nothing known at this time, but it's a game in a text editor, I'm pretty sure it can be broken easily. Initial release. There might or might not be more releases. Fixed game reset bug. The game should now properly reset after a game over/win. Minor changes. The game now resets by pressing "space bar" after a game over/win. Changed the game to reset the cursor to the bottom left so it's slightly more difficult to break in the case of a random click. Changed Mr Smiley to a spooky ghost for Halloween. This might get left in for months due to laziness. Back to normal, because I broke everything.